SAVE THE DATE FRI. NIGHT NOV. 9! MVCAN 2ND ANNIVERSARY CELEBRATION “BIG BLUE BLOWOUT"
Come find out about the most pressing news as Midterm elections heat up. INCREDIBLE MIDTERM PARTICIPATION OPPORTUNITIES CANVASSING - PHONE/TEXT BANKING - VOTER REG - TRAINING! Some of the 30 MV CAN-vassers training in Tracy in September. With each passing day, it becomes increasingly clear that the upcoming midterms are not just a choice between Democrats and Republicans, but between right and wrong.The first step in righting wrongs is just five weeks from today. Get all the latest updates on what you can do to make a real difference in the Midterms! Our new MVCAN Midterm Volunteer Weekly Bulletin is here! If you'd like to receive the Midterm Volunteer Weekly Bulletin, email Larry Litvak, llitvak@aol.com. MVCAN members will be departing for Reno on Saturday morning Oct 20 for arrival at noon. We will be canvassing on Saturday afternoon and Sunday, leaving Reno late Sunday afternoon. Travel together in carpools, stay together in local hotel, and group dinner on Saturday night. 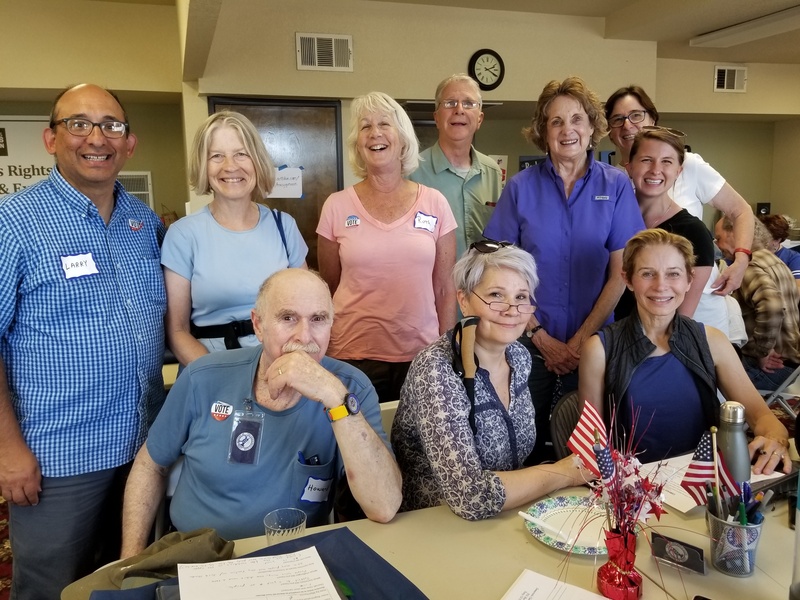 In a critical, competitive local race, come support MVCAN’s endorsed progressive candidate for Marin District Attorney, Anna Pletcher, by canvassing in Mill Valley- EVERY SATURDAY UNTIL THE ELECTION. Please RSVP to Peter Graumann petergraumann@yahoo.com. For details, see the MVCAN Midterm Volunteer Weekly Bulletin. 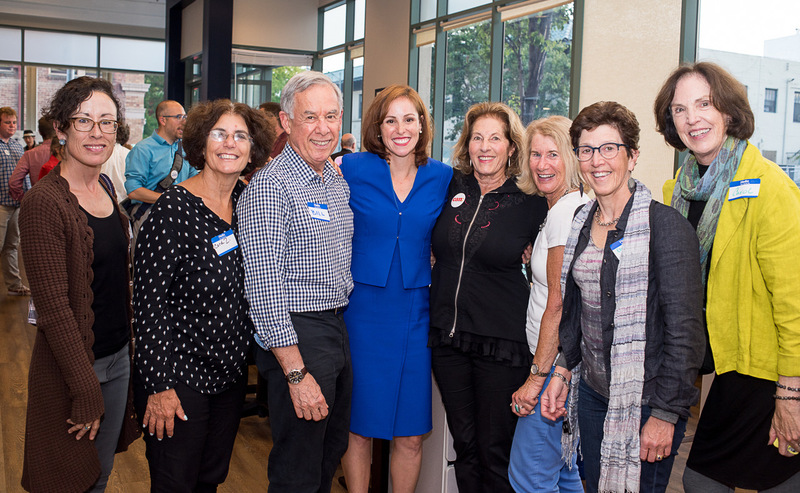 Leigh Ann Townsend, Carol Zimmerman-Leidman, Bill Jansen, Anna Plethcer, Rebecca Brackman, Marilyn Anderson, Elyse Foster and Carol Korenbrot at the Pletcher Campaign Kickoff. Photo: Susan Adler. See the latest MVCAN Midterm Volunteer Weekly Bulletin for a complete list of the many dates/times for phone/text banking. Phone/Text Banking will, in general, take place four times a week, and then even more frequently as the election grows nearer. Phone bank locations include Sausalito, San Rafael and Corte Madera. 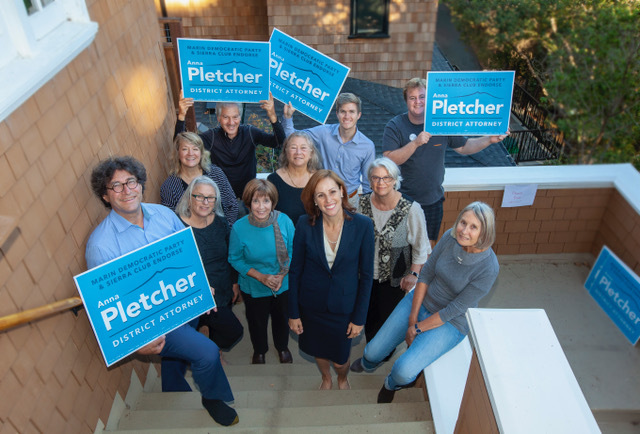 Come join in wonderful opportunities to work on key flippable races around the state and country, and to support Marin County DA candidate Anna Pletcher! Our Thanks to the Amazing Efforts of the Phone Bank Team Coaches! We couldn’t do it without them! Kudos to the phone & text bank coaches, headed by the irreplaceable Susan Bolle and her leads: Ruthanne Ranz Appel, Burr Leonard, Jean Bolte, Renee Linde, Lynda Sheridan, Leigh Ann Townsend, Gail Lester, Nancy Bourne, Carol Korenbrot, Carla Dingillo and Marilyn Anderson. Also, kudos to all the MVCANers who have been writing, sending emails and attending vigils to oppose Brett Kavanaugh’s nomination to SCOTUS! Now let’s fight back to investigate his perjury and other potential crimes and take back our Supreme Court, as well as our House and Senate. Anna Pletcher (center) drops by the MVCAN phone bank. Photo: Penni Gladstone. September Civil Rights/ Immigration Team Meeting. Photo: June Cooperman. The MVCAN Civil Rights/Immigration team has several excellent events to suggest to MVCAN members. Lucia Martel-Dow, legal services director of the Canal Alliance in San Rafael will be discussing immigration issues. MVCANers, including the entire core team, at Dining with Dems. Photo: David Kunhardt. 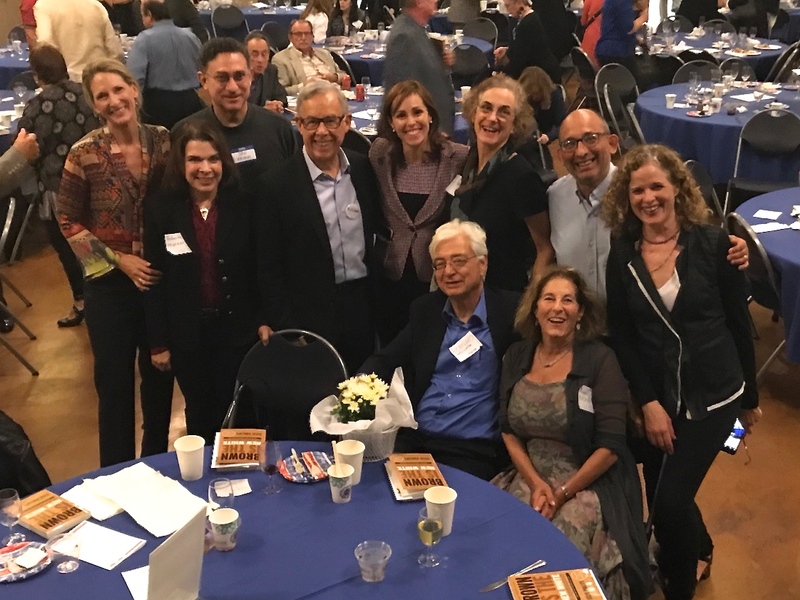 More than a dozen MVCAN members attended the annual Dining With Dems event for the Marin Democratic Party. The MVCAN gang was treated to terrific inspirational speeches, especially one from Tony Thurmond, candidate for California State Superintendent of Schools. We were so proud when our own Congressman Jared Huffman gave a big shout out from the stage directly to MVCAN and other local grassroots groups! Barbara Rowe, Rebecca Brackman, Peter Graumann, Supervisor Kate Sears, Danny Altman and Susan Gertman. Photo: Penni Gladstone. 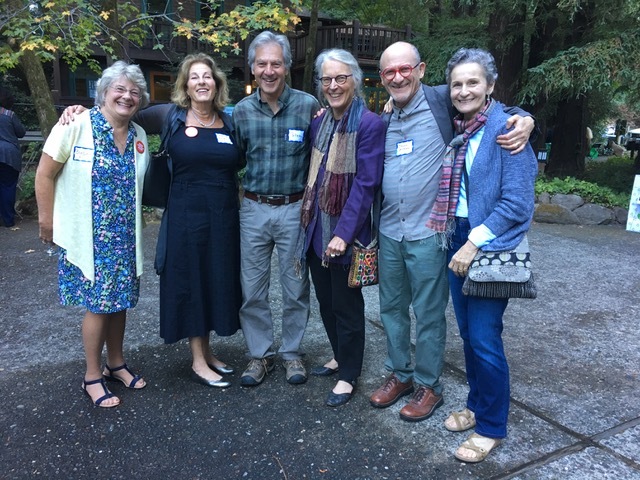 MVCAN members enthusiastically showed up for a Mill Valley fundraiser for Supervisor Kate Sears on Sunday. Kate has been a great supporter of MVCAN in many of our various endeavors. On Sunday she made a special acknowledgement of MVCAN for exemplifying what activists should be doing to preserve democracy. SAVE THE DATE - Fri. night, Nov. 9! 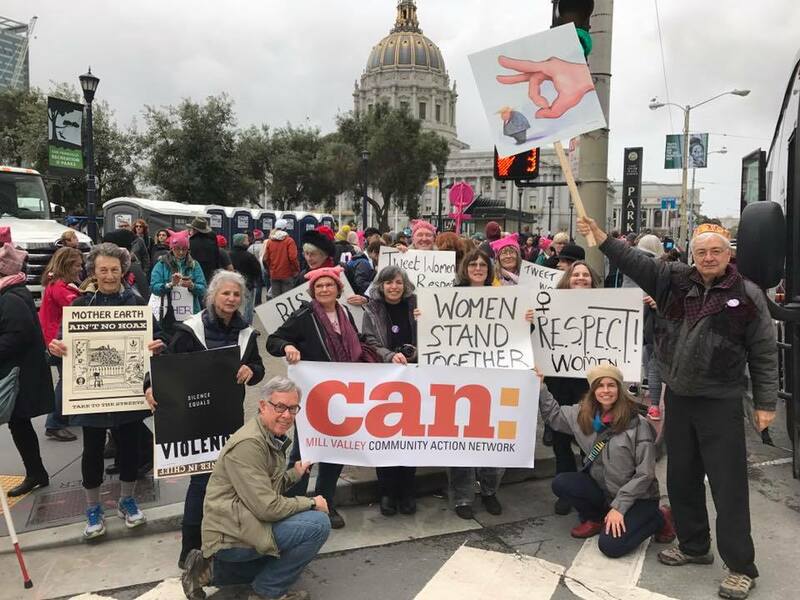 MVCANers at the 2017 women's march in San Francisco. Join in the MVCAN 2nd Anniversary and Election Victory Celebration!